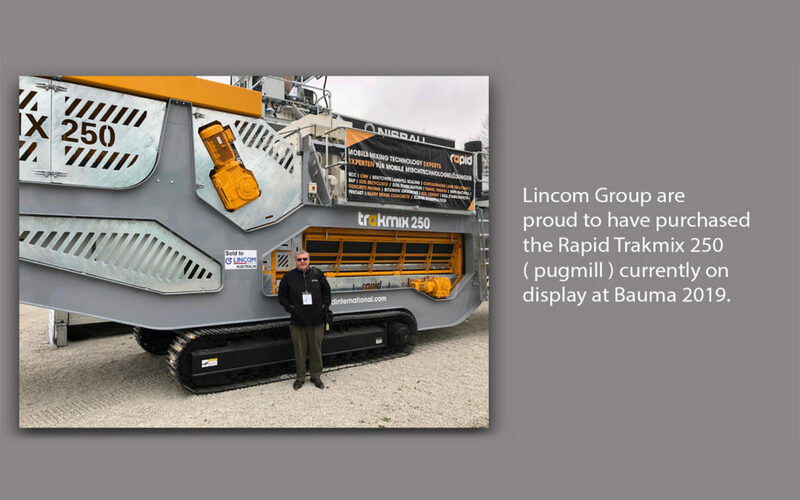 Lincom Group are proud to have purchased the Rapid Trakmix on display currently at Bauma 2019. Pictured on stand – Roy Watterson ‘Executive Chairman – Lincom Group’. The Rapid Trakmix is a track-mounted mobile continuous concrete mixing plant/ pugmill. Trakmix is totally mobile, self-contained, fully weighed and outputs high volumes. The machine has been specifically designed for applications where all types of binders or neutralising powders are required in the mixing process, including road construction, road paving, ground works /civil engineering, environmental stabilisation projects, aggregate recycling and many more.